Best pool in Sayulita - Really! Air conditioning throughout - Not just the bedrooms! Joya at Los Almendros in Sayulita (gem in Spanish), is truly a gem among the few condominium homes in town. 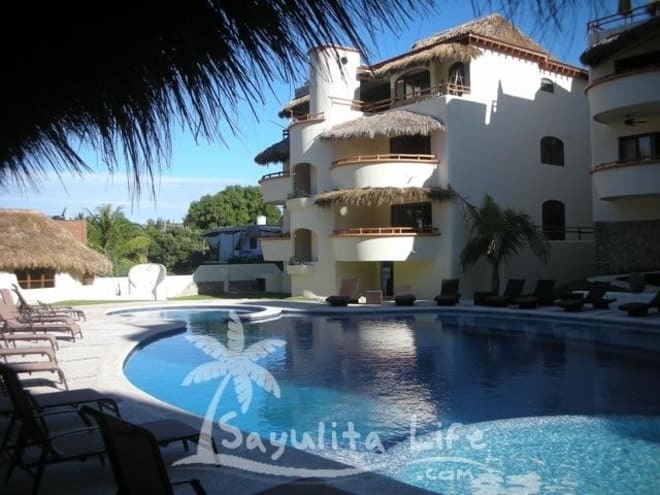 Bright, breezy, and comfy, Joya is a picture perfect two bedroom, two bath in a small complex comprised of 26 individually owned homes nested within five beautiful buildings that surround the largest pool in Sayulita. Our location is ideal - a block and a half from the quiet north side beach beach and just six blocks from Sayulita’s central plaza. It's a quick, flat, level walk to everything. Joya at Los Almendros also has an elevator - very convenient for carrying up baggage and groceries. But most importantly, we've made an effort for Joya to be comfortable and interesting. From the native handcrafted furniture and decor, to the well appointed stainless steel kitchen (we love cooking), to the high quality bedding, Joya is comfortable, easy living, and completely air conditioned. In addition, with each rental, we provide efficient, light housekeeping (every day except Sundays and holidays) If you prefer to not be bothered, just let us know. The pool is worth a special mention. The architect's intent was to design "the best pool in Sayulita". We probably haven't seen them all, but we're thinking he succeeded. Designed for beauty, lap swimming, and relaxing, the unique design is perfect for kids as well. There are four sections to the pool. A large area for swimming, a large 1 foot deep area for lounging (with or without a beach chair), a childs section, and a large section with bench seating and massage jets. Heated in Winter and cooled in Summer for year round enjoyment, the pool is surrounded by great lounge chairs and tables for dining. A large shady palapa area is also adjacent. Joya has a peaceful, relaxing feel we hope you can see in the pictures. With our two outdoor palapa roofed decks (great napping), three bancas (sofas) for relaxing, new beach chairs and umbrellas, and a concierge service to help with anything we haven’t thought of, you’ve come to the right place. So, turn off the TV. Read a good book. Relax by the pool. Take some great walks in the jungle or beaches. Eat some of the best (and best priced) food of your life. Or perhaps try surfing - that’s what drew so many people to Sayulita in the first place. Or...... do absolutely nothing. Joya is a perfect place for that. Trust us. We’re experts. Comfy beds with cotton linens. Close to Beach (1 1/2 blocks) and Town (6 blocks). Views of Jungle with a peek of the Ocean. Air Conditioning and Ceiling Fans throughout - Not just the bedrooms! Fully gated and staffed with on-site property manager and security. Umbrella, Chairs, and Towels provided for Beach. Monday-Saturday (except holidays) light maid Service included. The 2BR/2BA condo, which my friend and I rented, worked well for us. We especially liked the veranda overlooking the pool. The complex is close to several yoga venues, which was a priority for us. The pool is beautiful but we found that there were quite a few kids and their parents using it, which made it less desirable to us. All of the staff was responsible and responsive, especially Jessica, who staffed the office while we were there. Feb 24, 2918 - March 10, 2018 Nice comfortable clean condo. Everything was as listed. Joya at Los Almendros is a stunning property, with a wonderful pool and gardens throughout! Immaculately clean & kept up. The beach is a short walk away as well as great restaurants and activities. Joya at Los Almendros in Sayulita is absolutely amazing, we stayed here for a week and instantly fell in love with it. The interiors are impeccably furnished. We kept saying, whoever designed and decorated this must have an exceptional sense of aesthetics. It made us feel even better to see that locally made handcrafts have been incorporated everywhere in the condo. The kitchen is very well equipped including handmade earthen ware, tumblers and includes appliances like blender, coffee maker, gas stove, microwave, oven and all the other basic amenities you would need to cook and eat at home. There is A/C in all the rooms, there are two bathrooms with two sinks and showers. The bedroom is fairly large with in built shelving, desk and chairs. The view from living rooms balcony and bedroom is breathtaking. The pool is the best designed pool I have ever seen! I felt safe to go there with with my 5 and 9 year old, there is plenty of shallow areas in the pool where even non swimmers like me could relax. The property is very well maintained and staff is very friendly and helpful. It felt like sweet home away from home. Thank you so much for doing such a great job in keeping this place up. Best in all of Sayulita for sure! My husband and two kids (ages 11 and 8) had a fantastic week in Sayulita and loved staying in Joya at Los Almendros. The pictures don't do the space justice. The TV did not work (which wasn't really an issue for us) and there were some issues with some of the appliances (toaster, coffee maker and A/C) most were dealt with and the communication was great. We were given a slight rebate due to the inconvenience. The beds were very comfortable, there are TONS of towels - such a treat - there is maid service, which I didn't realize when I booked, and the pool is spectacular. It was a real treat to stay here and if I have the opportunity to go back to Sayulita, I hope to stay here again! Joya is a beautiful condo in a beautiful place. We were impressed with the amenities, and the condo had everything we needed. Loved being on the quieter north side of town, but close to beaches, bars and restaurants. Staff were efficient and friendly. We were traveling with our two kids and Joya was a great fit. The apartment is beautiful (much nicer and bigger than it looks in the pictures), the beds were very comfortable, and the pool is truly great. It's a five minute walk to a bunch of great local restaurants and a beautiful beach. There's also a cleaning lady who came every day, and a very helpful site manager available for any questions. We had a great experience and would highly recommend this place. We enjoyed our stay at Los Almendros in Sayulita. Joya was very comfortable. We could come and go as you please. Very well kept and very secure. Loved the terrace, we would have our morning coffee there before hitting to town. Erika kept our apartment very clean. We had everything we needed. Definitively will come back. Everything was perfect and just as described. Joya had everything you could need. We highly recommend it. Fantastic pool, great for kids! My wife and I stayed a week at Joya with our 8 month old daughter and loved it! The staff was great, so kind! The place is unreal! So pretty! The pool was fantastic and great for kids of all ages. Everything was clean. really our favorite rental ever! We'll be back! Prices are in US Dollars. Nightly prices for each season posted in listing are based on weekly rates. Rentals less than a week are more per night as shown below. Prices include light maid service every day except Sunday and Holidays. High Season (October 16 - April 30): $1595/wk or $250 per night if less than a week, 3 night minimum. Total due for stay is prorated for dates that include more than one rate rate. Terms: 50% to secure reservation. Balance is due 30 days prior to your visit. No Sunday departures in high season unless a last minute booking. Owners Angela and Michael were taken with Sayulita on their very first visit. (Michael's son Matthew discovered Sayulita on a surfing trip many years ago.) Michael is a retired filmmaker and Angela is a retired mathematics educator and quality improvement advisor.